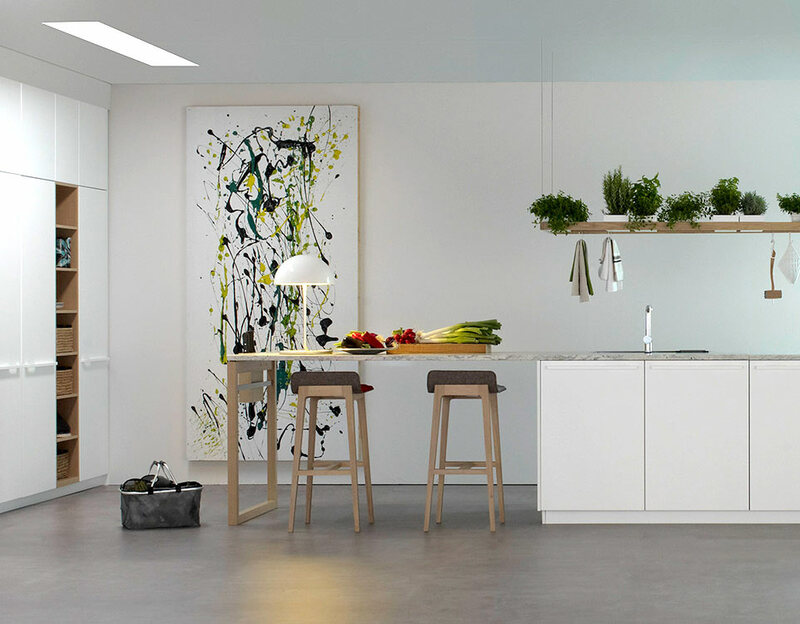 INFOR, the manufacturer of kitchen furniture and fittings located in Zaragoza (Spain), markets its products mostly in Spain. However, it was seeking a kitchen programme that would be convivial and would stand out above the other kitchens on the market and the ones it was already producing. It also wanted to maintain a mid-range price in terms of production costs. We have been working in collaboration with ABAD designer-architects team in BILBAO. They have wide experience in furnishing programmes and in their implementation. Two main ideas have guided our research: accessibility and plants. Accessibility: by observing a professional chef, we became aware of two important movements: hanging and lifting up / storing away. So we have imagined a kitchen that would have places where cloths, large spoons etc. and even sausages could be hung and with places to store things so that everything is within easy reach. Plants: small ceramic containers are incorporated into the cooker surface to form a garden of culinary plants. A wheelbarrow enables the plants to be taken outside to be watered.